BOISE — (Jan. 20, 2015) — A new statewide poll found that 90 percent of Idaho residents approve of livestock grazing as a legitimate use of public lands, the same percentage as guided recreation and mountain biking. 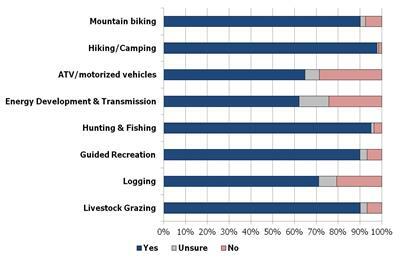 Ninety-eight percent of the respondents approve of hiking and camping on public lands, and 65 percent approve of the use of motorized recreation such as ATVs and motorbikes. The new survey conducted by the University of Idaho Social Science Research Unit for the Idaho Rangeland Resource Commission (IRRC) was based on 585 telephone surveys with Idaho residents. The poll was completed in December 2014. More than half of the survey participants have lived in Idaho for more than 30 years, and participants represent a diverse cross-section of political ideology, UI officials said. Public support for livestock grazing was approximately 20 percent higher than it was for logging, which had a 71 percent approval rating. Using public lands for energy development and transmission lines received the lowest level of support at 62 percent. Public approval of livestock grazing on public lands went up 1 percent since 2010, and 10 points since 2001, according to previous polls conducted for IRRC by the University of Idaho. “We’re pleased to see public support for livestock grazing on public lands increasing,” said Chris Black, IRRC board chairman and a Bruneau Rancher who has received a BLM national stewardship award for exemplary livestock management on public lands. “We think Idahoans are seeing improved range management when they’re out recreating on rangelands and forests. And over the last five years, we’ve highlighted more than 30 stories of ranchers engaged in rangeland stewardship through the Commission’s “Life on the Range” web site and video series. In a wildlife-related question, the poll found that 84 percent of the respondents recognize that private ranchlands provide important wildlife habitat. On a scale of 1-7, 68 percent of the respondents rated the value of private farms and ranches for wildlife as being a 5 or higher. Seventy-nine percent believe that sheep and cattle ranchers manage rangelands in a responsible manner, and 82 percent believe that livestock grazing should continue to be part of public lands management. In a series of questions rating the credibility or reliability of information provided to the public, ranchers and scientists rated 84 percent and 83 percent reliable, while BLM officials received a reliability rating of 80 percent and environmentalists received a rating of 55 percent. The poll is statistically valid, sampling a broad cross-section of Idaho’s rural and urban residents, an equal number of males and females, and mobile phone users as well as landline users, UI officials said. Click here to download the full report. About the Idaho Rangeland Resource Commission: The Idaho Rangeland Resource Commission is an Idaho state agency that seeks to increase public understanding about the balanced management of public rangelands. The commission sponsors the award-winning web site, www.lifeontherange.org, and it provides information and educational materials to Idaho’s school children. For more information, see www.idrange.org.